By now, you've learned how to make a Stock Watch List, why you should ask countless questions about your company's future business prospects, and what qualities are most desirable in a company. At this point, you've hit the jackpot. Right? Unfortunately, successful investing requires you purchase great companies at great prices. You can't just buy great companies. Now's the time to focus on buying your great company for a great price - something 95% of investors never bother to do. Nevertheless, the price you pay has a significant impact on the performance of your investment portfolio. Next to the company you're buying, it's the single most influential factor in the future performance of your investment. So ignore price at your own peril...! However, take a moment to read the next two web pages, and you'll gain valuable investment knowledge that will put you light years ahead of the 95%. Almost everyone agrees this is the key to stock market success. Yet 95% of investors ignore this common sense advice, even while they preach it. Instead, they buy a stock, and then they hope and pray it will rise in price. Sometimes, they actually make a well-reasoned business perspective decision, buying a stock because they believe the company is great. Such a decision still results in lackluster investment returns. 95% of investors completely ignore the Basic Principle of Investor Return. They ignore the price they pay, choosing to believe that a stock will rise in price because "it's a great company" or "it's got a lot of upside potential." Consistently successful investors never do this. They lock in superior investment returns the moment they purchase. By understanding and applying the basic principle of investor return. Obviously, Company A is the superior investment because the earnings are higher. Right? Then it's Company B, because the earnings are growing faster? Although Company A's earnings indicate it might be a better company, you don't have enough information to determine which company is the better investment. In a nutshell, that's the basic principle of investor return. Write it down and videotape it. If you only remember one thing from this entire website, that's what you should remember. It doesn't matter how great or bad your company is. 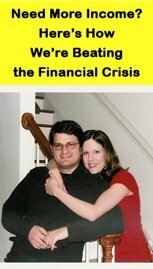 If you overpay for it, your investment returns are certain to disappoint you. Nike (NKE) is a great company. Right? It's one of the most recognized brands in the world. It has zero debt, massive free cash flow, high returns on equity, strong and consistent earnings, etc. But is it worth $100 trillion dollars today? Is it worth more than a $1 today? Well then, what's it worth? Once you identify Nike's actual value, your rate of return is determined by the difference between the price you actually pay and the company's actual value. To illustrate, let's take a second look at our two hypothetical companies. Company A sells for $20. Company B sells for $5. Does that give you a better idea of what to buy? 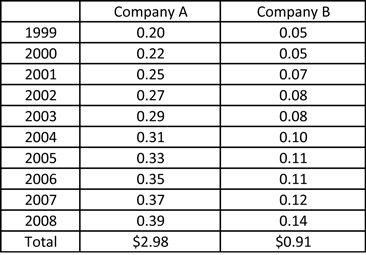 While Company A has higher earnings relative to Company B, it's not the better investment in this case. Because the price of Company A relative to Company B negates its earnings advantage. You can always overpay, even for a great company. It's one of the most common mistakes investors make. The key is to pay a reasonable or dirt cheap price for a great company. After all, that would be buying a great company at a great price! And if you do that, you'll become wealthy. How do know what a company is worth? And while it's not an exact science, you can find the answer.